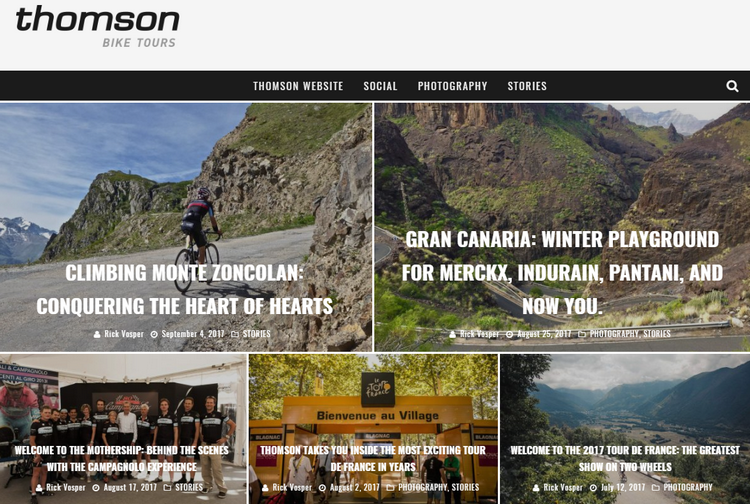 Thomson Bike Tours is an elite provider of cycling destination travel to the biggest races and most challenging routes in Europe. After seeing my editorial work on sites like Red Kite Prayer and Bicycle Retailer, Thomson put me on retainer as their in-house blogger early in 2017. Starting with the goal of making the blog a more effective tool to pull visitors to their main site, I evolved the Thomson post style to a friendlier voice that better reflected the company’s branding. I also started including more contextual and historical data in the posts, making them more like travelogues and less like a rehash of the trip itinerary. The approach seems to have worked: blog traffic is up over previous year; ditto blog-to-site conversions. You can see more of my work for Thomson here. If it’s true the heart of cycling lies in Italy, and the heart of Italian cycling lies in the Dolomites, then surely the heart of the Dolomites lies at the 1,750m summit of what’s widely considered the toughest climb in all the Grand Tours: the grueling, lung-searing, leg-shattering 9.8 km ascent from Ovaro to the summit of Monte Zoncolan.